Norbert Hofer, of the racist populist Freedom Party of Austria (Freiheitliche Partei Österreichs, FPÖ) failed to win the country’s presidential election. After all the votes were counted Hofer’s gained 49.7% of the vote against Alexander Van der Bellen’s 50.3%. Bellen is a former Green party leader running as an independent. The vote couldn’t have been any closer. Just 31,000 votes out of more than 4.6 million votes separated the two candidates. Don’t be fooled by the well-dressed and self-proclaimed Margaret Thatcher fan. As we have reported, Hofer’s campaign was based on racism directed at Muslims, migrants and scapegoating refugees who have sought sanctuary in Austria. One of his key election slogans was “Islam has no place in Austria”. Hofer himself is an advisor to the FPO’s anti-Semitic leader Heinze-Christian Strache and has urged the party even further to the right. He is a member of a deeply reactionary pan-German nationalist student fraternity, an irredentist who wants Italy’s South Tyrol to be incorporated into Austria, and a man who has been photographed wearing the blue cornflower symbol adopted by Austria’s Nazis when they were banned in the 1930s. 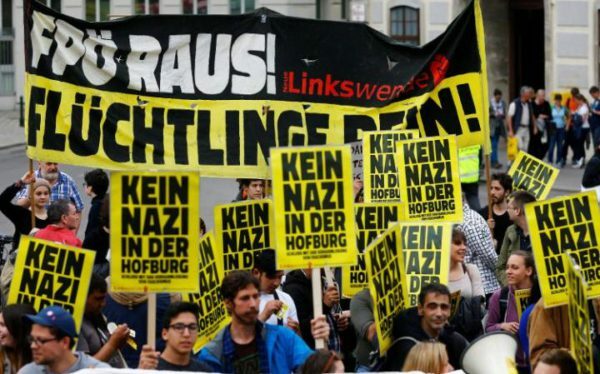 Austria anti fascist have played an important role protesting against the FPO and exposing their vile racist campaigning. The FPO will be disappointed with the result, but they know that they are in a strong position, they consistently scores more than 30% in the opinion polls. They also know that they have pushed aside Austria’s discredited centre left Social Democrats (SPO) and centre right People’s Party (OVP), which took only slightly over 11% each in the first round of the election. Austrian politics has polarised sharply, amid rising unemployment and inequality – voters have abandoned the centre parties and their pro-austerity coalition government. Sadly Bellen offers more of the same, he supports austerity measurers and his response to the FPO’s racism has been feeble to say the least. Hofer and the FPO are not alone; they are part of the resurgence of fascist and racist populist parties across Europe. and there will be a rerun on the 4th of December (https://www.theguardian.com/world/2016/sep/12/austria-presidential-election-rerun-to-be-postponed-faulty-glue-ballot-papers). The worstcase of a Hofer-Presidency is unfortunatly still possible.